As I mentioned above, the number of casualties was coming out far too high. Morale cannot now drop straight through to dispersed from one unit's volley. It needs to already be at routed before an attack can drop it to dispersed. Meaning at least two volleys ( or a volley then close combat). Rationalise naming of army files. Previously the full path was retained in scenario files. 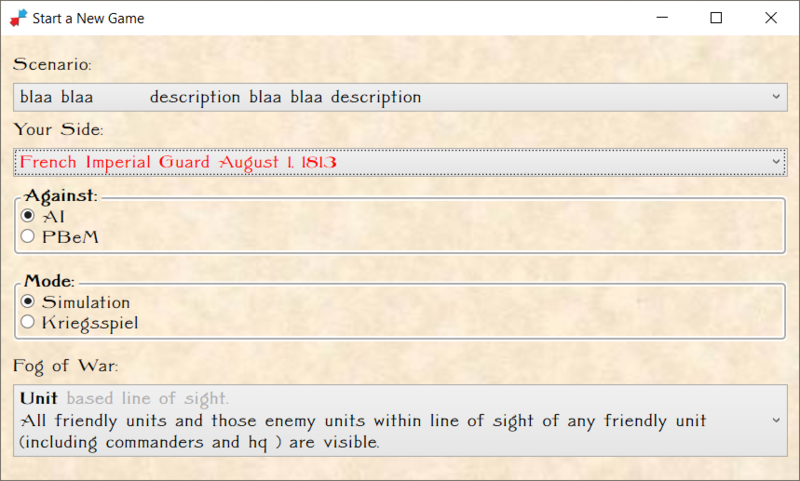 Since that is in appdata and includes user name, only the army name will match from one user's machine to another. Since we've not yet delivered the scenario editor it's only Ezra and I really need to worry about this for now. Best to neaten things up as I notice potential future issues though. Show messagebox when army file handed to ReadArmy cannot be found. Previously it just crashed and burnt. Now it'll still crash and burn but you'll at least get a messagebox telling you what it is looking for. Why might you not have an army file? This could happen if you change an army name after adding it to a scenario or you just don't have an army a scenario is relying on. Note that all files must be in your user's appdata in the correct folders. You can't use an army file you put on a usb or from just anywhere on disk. Exactly where files go will have to change when we deliver the live version via steam. Steam has it's own delivery mechanisms and game folder structure that we will need to conform to. Force focussed element bindings to transfer to viewmodels so their values are committed prior to saving. By default, wpf bindings transfer data from the UI to their viewmodel when focus is lost. Clicking on a menu item or using a keychord like Ctrl+s doesn't make a control lose focus. Hence you could potentially lose a change to the last field you edited when saving. Force sliders to "snap" or increment/decrement in integer intervals ( no decimal places ). None of the values make any sense to numerous decimal places as you could previously set when dragging. Change file naming so it uses the scenario name. Remove full url from scenario. This couldn't work cross machines and it's a bad idea to allow saves outside the expected file structure anyhow. If wanted to back up files then you can use file manager at the moment. Steam has cloud back ups built in. 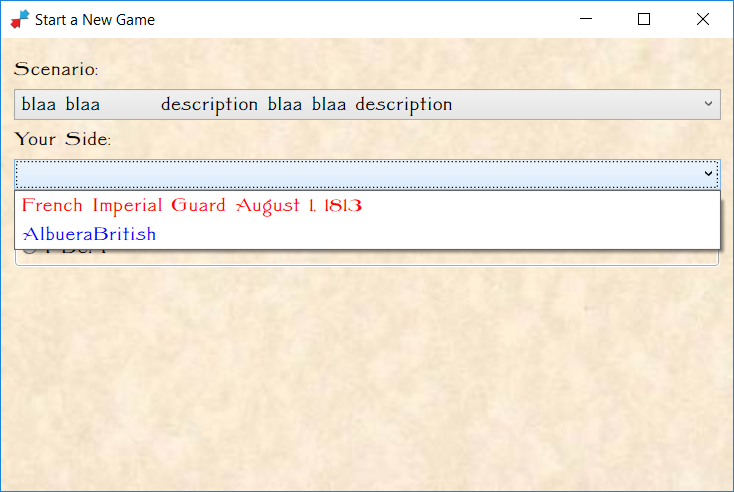 Move scenario name / description army names and turn length into a new first tab. Both changes are for consistency with other apps. Moving the scenario name etc makes it far clearer what scenario you have in case you're unfamiliar with it. Added start time and a new control that allows you to edit that time. You can type in hours and minutes. And or use the mouse scroll wheel to increase/decrease either. There are also up-down repeat buttons if you prefer clicking to scrolling. A repeat button keeps on clicking when you hold it down ( like the up and down arrows on a browser scroll ). Hours "clock" so as you scroll up it will go from 23 to zero and scrolling down from 0 takes you to 23. Minutes work similarly except obviously 0-59. As you scroll over 59 and the minutes reset to zero an hour is added, as you go the other way it is subtracted. The mousewheel scroll can be much faster, especially if you have one of those mice whose wheel will free wheel quickly. I use a Logitech mx master 2s and I can just spin the mouse wheel. Hours or minutes will then change like a blur. 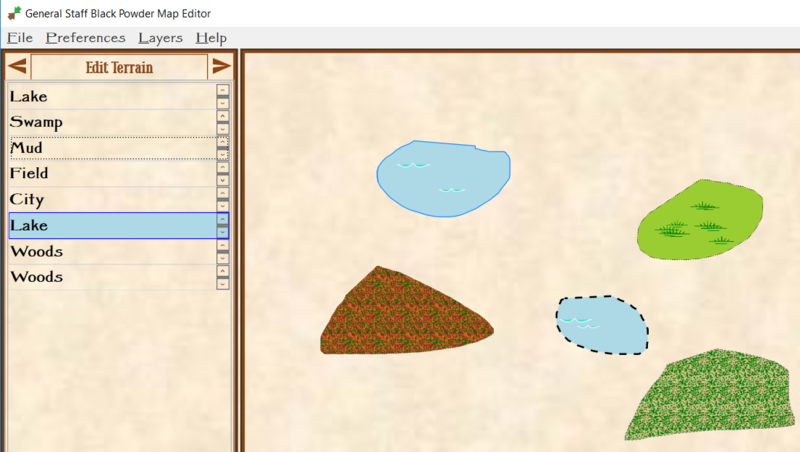 Added right click piece of terrain in Edit Terrain mode selects that terrain. This allows you to identify which terrain you want to work with in the left panel from what you're seeing in the right. The selected terrain is outlined in blue and given a light blue background in the left panel list. Yes, I've actually started to do some work on the game itself. Started to build out the main containers and tabs. When I made piece size snap to integer numbers, I also broke the other menu sliders used for opacity. Fixed these so they snap to 0.1 change and use large change of 0.1. Large change is used when you click the button on either side of the slider. Commit start time values when typed. As part of this change I've improved the process which commits bound data when the user clicks a menu item or uses a key chord to save a scenario. By default, bindings transfer data from a textbox to the viewmodel ( which is where data is saved from ) on lost focus. Clicking a menu item or using a key chord does not make a textbox lose focus. Force reload of map when loading another scenario with same map. Minor changes to how courier distance is calculated. 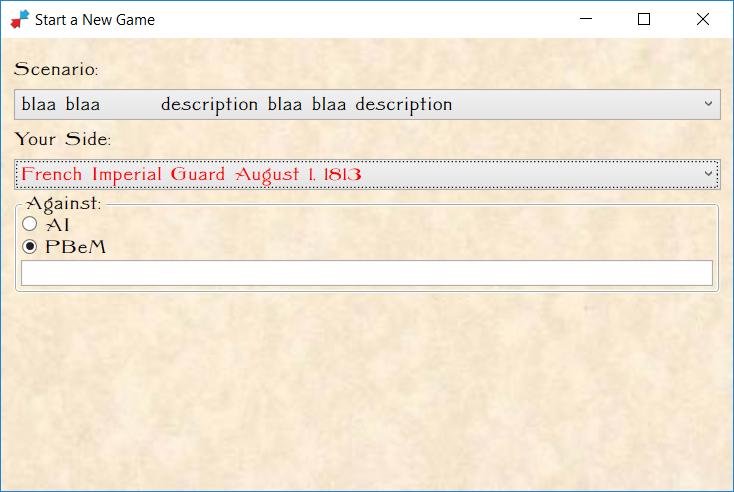 This is still a prototype because - when finalised - it will be used in the game rather than scenario editor. The url have moved since I set these up. Working on the start new game process. Not much I can actually show you yet though. Sketching out the new game view. Largely because there's a lot of structure associated with creating something which will encapsulate a game / game save. You pick a scenario from a dropdownlist. That then has two sides in it. You pick which of these you will be playing. You then pick who or what you will play against. The textbox for email address appears when you choose PBeM. Disappears when you pick AI. You're not emailing your computer. This specific aspect will almost certainly change significantly. It could well be most people only play one or two friends - so inputting a (short) list of name and email address separately would suit better. Eventually, we could build a web site allows you to find opponents and arrange games. Which would of course have a cost associated that we'd have to cover somehow. Maybe google ads would be enough. There are also other options to add to this screen. 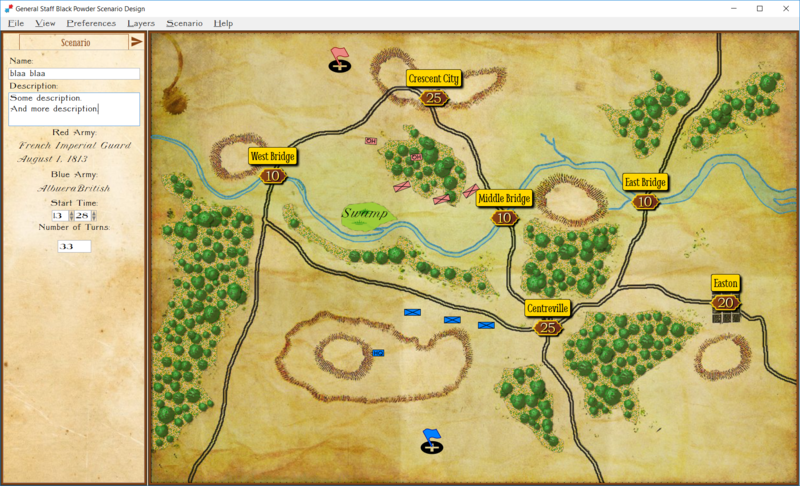 Added Fog of war selection. This is a drop down, defaulting to unit based view. All means no fog of war. Unit is like pretty much every other game works and you see all your own stuff plus any enemy which is in LoS of your units. Commmanders is units your commander or HQ can draw LoS to. That applies to your own combat units as well. HQ means you only see units your General/HQ can draw LoS to. Personally, I think Commanders or HQ based visibility will not work. You need to be able to see your own units to give them orders. You will of course need to be able to see enemy units to react to them. If both your unit and one it somehow ends up fighting are out of sight all you would see as a player is a report some time later. Added checkbox in layers menu to toggle retreat point visibility. Fixed up the clear scenario process which wasn't clearing hardly anything. 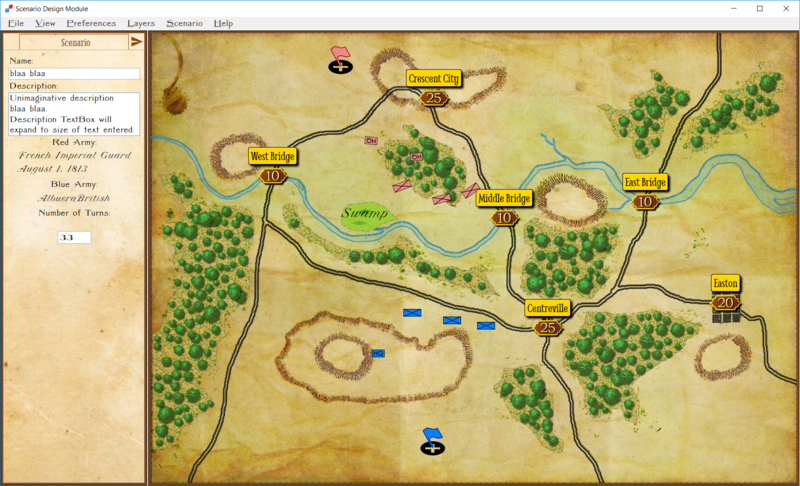 Now when you choose new scenario the old map and army are cleared.